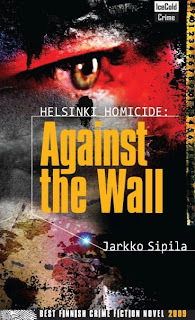 I got around to ask Jarkko Sipilä some questions on his newly-published book Helsinki Homicide: Against the Wall. It seems getting the book out in English has taken some activism. "Only very few Finnish books are getting translated in English", says Sipilä. "That's a problem that doesn't seem to worry Finnish publishers very much, and we don't have many agents working here." So Sipilä and his brother, who's living in the US and has been working in Wall Street, decided to put up their own publishing house getting Finnish crime novels out in English for the American audience. "If no one else does it, we'll do it by ourselves", says Sipilä. The new publisher is called Ice Cold Crime, which brings to mind images of Scandinavian winter and snow. Ice Cold Crime is publishing next another book by Sipilä, whose work is strictly rooted in the police procedural and its hardboiled subgenre. Then they'll probably publish something by Harri Nykänen. Nykänen is slightly better known in the US, since the Raid TV series made from his novels was shown in some cable channels there. The big problem promoting Finnish literature in English-speaking countries is that almost no one speaks Finnish. There's also the problem of getting good translations. Says Sipilä: "We asked for four translation samples and chose the best of them. We also had a proper copy editor who worked with the text and a professional graphic artist to design the books." "This is of course taking the first steps, making connections, but we'll see how this works out", says Sipilä. I might be making more posts on this topic to help Sipilä out. And I'd really like to see people spreading the word. If someone's interested in obtaining a review copy, I'm sure you can contact Sipilä through me, in a comment or an e-mail. Edit: seems like your best bet to get the book is via Amazon, at least for now. For the Finnish readers, the book will be available in bookstores in Finland. so, i'm guessing i could pick it up in Cambridge or London this summer. I'll have to ask Sipilä if the book is available also in the UK. This sounds interesting. I'll put up a post in the next day or two. Peter, if you're interested in a review copy, let me know. I'm sure it can be arranged. I bought a copy of Against the Wall in one of the airport news stands at Helsinki-Vantaa. I've done a wee review of the book on my blog here: http://lightfromthenorth.blogspot.com/2009/10/helsinki-homicide-against-wall-by.html from the point of view of some one who lives in Helsinki but isn't good enough at Finnish to read the original untranslated version. Stieg Larsson, the British crime writer?